The Browning Light Minnow Combo is a manual folding knife that compliments this awesome little keychain flashlight in both size and color. These are two tools that are compact and convenient, you would want to take with you wherever you go. 7Cr stainless steel, drop point blade has a satin finish. 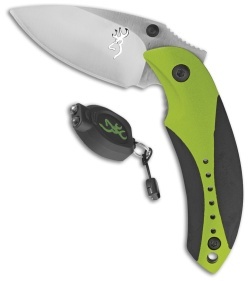 Black and green aluminum handle with a lanyard hole and pocket clip. 13 Lumens flashlight, lasts 12 hours on low, takes two 2016 Lithium batteries (included) and keychain.